Mrs M’s been travelling to US quite often lately and she’s totally at the mercy of her American mania! While writing this post now she is on a window seat, on her way to L.A., between a family of 4 kids (aged from 12 months to 9 years). Even so and even if she was kind of excited to have 12 hours on her own, with no kids around and a good book to read, she finally started to talk to this poor mum, totally surrendered to her mad kids! By the way, Daddy is conveniently located something like 20 rows ahead. (Is it relevant to say that I offered him my place and he refused?! Needless). Anyhow, bottom line is that in every – EVERY – circumstance, Mrs M would love to talk and meet and ask questions to Americans, so basically a cheesecake – the most authentic American dessert possible, I think – it had no option for this quick post. Apparently if you are a food blogger, a professional food blogger I should say, you cannot avoid heart recipes at this time of the year. Albeit I am not any close to the professional status, but I aim of course to be a professional food blogger (! 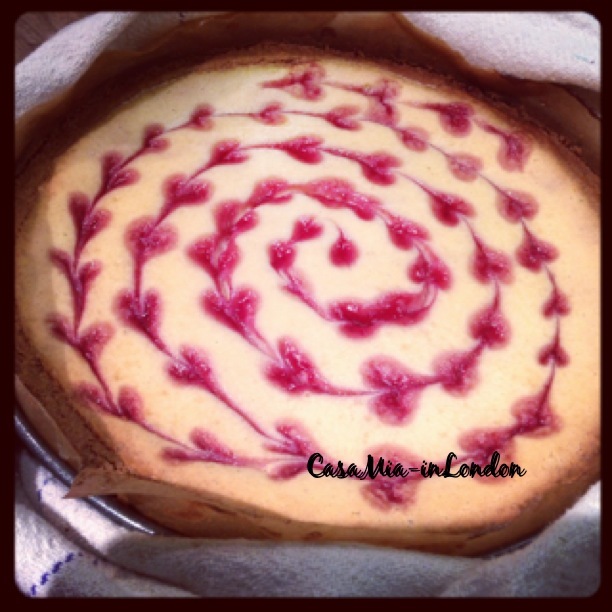 ), here it is my heart-yet-not-that-arty cheesecake. I have to say it has never been one of my favourite dessert but I always heard it was quite easy to make and also very versatile. And it is, in fact. I figured, also, that it is possible to go wild with both the crust and the filling, and since I recently found one of my most precious food blogger muse in terms of cake design (www.cookingclassy.com), I couldn’t help but trying to remake her hearty-swirling cheesecake… trying just to make it more Italian. My recipe took inspiration from her website, amongst the others. First of all prepare the cheesecake base, as it needs to rest in the refrigerator for at least 1 hour. 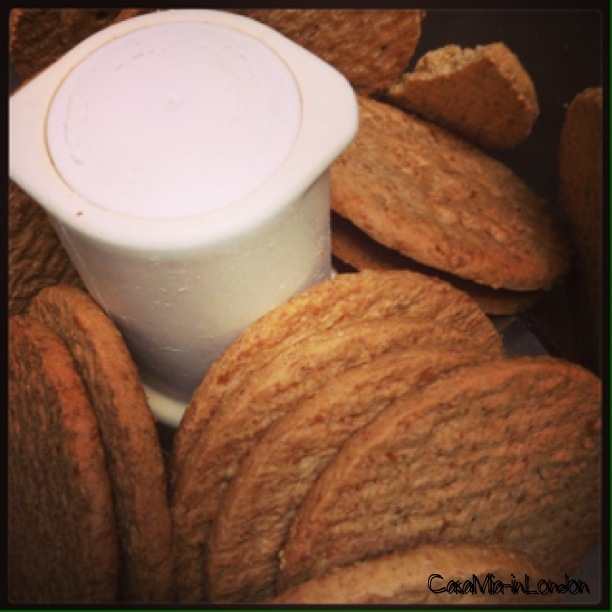 With the help of a food mixer, blend the digestives biscuits together with one tablespoon of sugar. Melt the butter in a small saucepan, over low heat, and add this to the digestives mixture. Butter the mould and line it with parchment paper, butter it again. To do this, I cut a circle and a long stripe of parchment paper. It would be better to use a mould with a removable base. 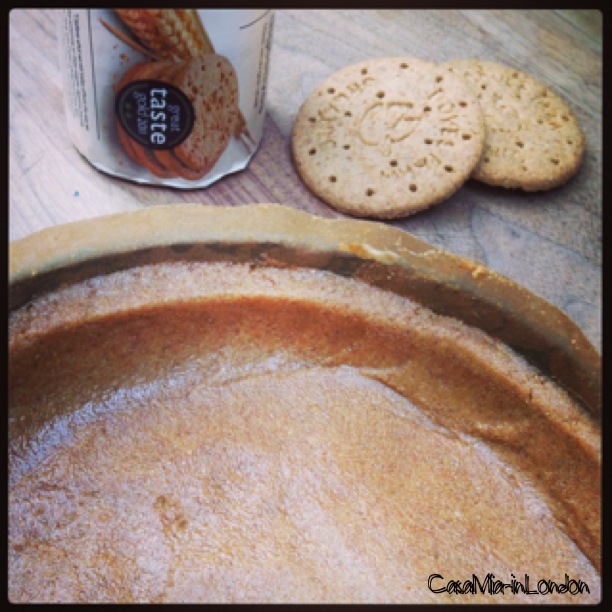 Pour the digestives mixture in it and with the help of a spoon flatten it down and along the sides. Rest the cheesecake crust into the refrigerator for at least one hour. Turn the oven on at 170°. In a large mixing bowl, with the help of a mixer, mix together the ricotta cheese with the crème fraîche and the 70 gr of caster sugar, until soft. Break the egg and the egg white, combine them together and add these to the cheese mixture. Place the chocolate in small pieces into a saucepan, and then place the saucepan into a shallow pan of warm water, where you have already laid down some paper. This way you are melting the chocolate on a Bain-Marie, avoiding it to split. Add the whipping cream (without whipping it) to the chocolate, when it is melted – and combine everything together thoroughly. Now add the chocolate mixture to the cream one already made. Mix it and leave it on the side. This is the cheesecake mixture. In a small saucepan, cook together the raspberries and the 180 gr of sugar. Pour the raspberries and the sugar into the saucepan and stir it very well. Cook this on low heat, trying not to touch the mixture too much, otherwise you may have sugar crystals which absolutely don’t want. (To convert Fahrenheit to Celsius, subtract 32, multiply by 5 then divide by 9). In our case, you just need to bring the mixture to boil, then lower the heat and leave it simmering and wait until it thickens just a little bit. If you keep the heat very low, it takes around 3 minutes. Do not let it boil for too long, or – once cooled down – it will be too thick. If you have a sugar thermometer, 100C is the right temperature to remove the sugar from heat. The best way to stop cooking the sugar right away is to have a bowl with very cold water ready on the side, and immerse the saucepan with the cooked sugar into the cold water as soon as you have reached the sugar stage desired. If you don’t do this, the sugar might keep cooking and get too solid when you need it. Once the sugar is ready, pour it into a measuring jar, forcing the sauce through a fine mesh strainer to remove the raspberries seeds. Then set it aside. Now you can assemble the cheesecake. Remove the crust from the refrigerator and pour a little bit of the cheesecake mixture into it, to cover the base. Spread evenly. Add a couple of spoons of the raspberries sauce, and try to spread this evenly as well – with the help of your spoon. Now pour the remaining cheesecake mixture on top of everything, to cover up what you have already poured. (Basically you don’t want to show any raspberries sauce through). 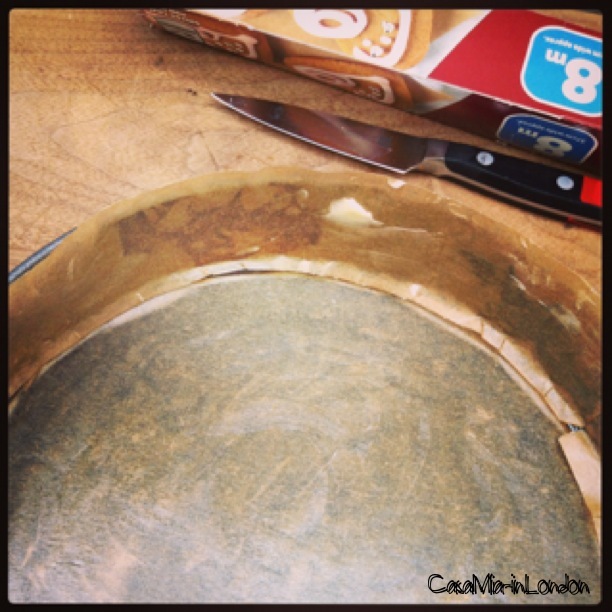 When your décor is ready, bake the cheesecake until the centre is firm but if you shake the mould gently, it should still wobble a little, and the center will still look a little wet. Depending on your oven, it is about 40 minutes. To prevent the cracks on the cheesecake surface, you may bake it on a Bain-Marie. Place the mould into a roasting tin and pour enough water to come to two thirds of the way up the mould. When it is ready, turn the oven off and leave the cheesecake in for 5 more minutes. For best results, serve it the day after.